Source: Meridian 508.20 CD player used as a transport, Audio Logic 2400 DAC. Preamp/Integrated: Tom Evans Design Vibe. Cables: Nirvana S-X interconnects between DAC and preamplifier, Nirvana S-L interconnects between preamplifier and amplifiers, Nirvana S-L speaker cables between amplifiers and speakers, and a custom Nirvana wiring harness to connect the Duos midrange and tweeter horns and woofer module, Cardas Neutral Reference digital cable. Review Component Retail: Cardas Lightning 15 Digital Cable ($266 for 1 meter), Cardas Golden Reference Interconnects ($917 for 1 meter), Cardas Golden Reference Speaker Cables ($2388 for 10 feet), Cardas SE 9 Speaker Cables ($667 for 10 feet), Cardas SE 9 ($279) Avantgarde Duo Wire Harness (pair). When I arrived back at my residence after a long day in the office, I found that my house manager had left an unmarked cardboard box on the desk in my study. "Odd," I thought, "Delphi's always told me when a package has arrived, but she has never left it on the desk in my study before - she knows the study is off-limits." I punched the intercom button: "Delphi dear, who's the package from that you left in the study?" The intercom crackled and Delphi said "I don't know what you're talking about sir. I haven't been in the study." Curious and perplexed, I clicked off the intercom and cut open the cardboard container to extract a finely crafted rosewood box about a half a meter in length on each of its three axes. The box' exterior was smooth and unmarked, and except for a ten-tumbler combination lock on one face of the cube, it gave no indication as to its contents. I looked through the packing materials for instructions on how to open the box - or at the very least something with a combination written on it; but to no avail. Irritated, I thought "Who would send me something so absurd?" Knowing that there were 10-to-the-10th-power possible combinations for the 10 tumblers to open the box, I didn't even try. That's ten billion possible combinations! Taking the box with me, I walked down to my listening room. Setting the puzzling box aside on the couch, I turned on my beloved Fi 2A3 monoblock amplifiers and Audio Logic 2400 vacuum tube DAC. While waiting for the tubes to warm up, I poured myself a glass of port, then sat down in my listening chair to enjoy Sunday at the Village Vanguard by the Bill Evans Trio on a JVC XRCD [JVCXR-0051-2]. As the evening sun faded, I got up to light the candelabra by the window overlooking the pool. As I did, I noticed something peculiar - the rosewood box appeared to be dimly glowing. Upon closer inspection, I found faint writing on the box glowing cobalt blue in the light cast by the 2A3 tubes of my trusty Fi amps. Intrigued, I walked over and turned on the lights. I walked back to inspect the box more closely. To my amazement, the writing was gone! Puzzled, I walked back and turned off the lights. Once again, the faint blue writing reappeared in the light from the tubes: The writing could only be seen in the light cast by a 2A3 tube! Upon further careful inspection, the writing turned out to be sequence of numbers; ten numbers: 1123581321. The combination for the lock! But then I thought, "How odd is it to use a combination that could only be discerned in the light of a 2A3 tube." Unless, of course, it was a message meant only for me, not to be discerned by anyone else among the secret audio society of Eastern Washington State. This was intriguing. It meant someone knew I was the only one among the local audio Illuminati with 2A3 amplifiers. What could it mean? Then it dawned on me. The combination of 1123581321 was the Fibonacci sequence of 1-1-2-3-5-8-13-21! Leonardo Fibonacci was the famous 13th century mathematician who had developed the legendary sequence wherein the sum of the first two numbers produces the third number, and the sum of the second and third numbers produce the fourth number, and so on. But not only that: 21 divided by 13, 13 divided by 8, and 8 divided by 5 all give the same ratio: 1.615384. I recognized that number as the Golden Ratio Phi immediately. Ha! I now thought I knew who my conspirator was! I entered the numbers into the tumblers and heard a small click as the top of the box was released. I lifted up the lid of the box to see inset into the lid's underside a beautifully carved nautilus symbol of maple burl outlined with golden wire. Below it was another number sequence inlaid in gold: 1.615384. On top of the contents of the box was a series of parchments with all kinds of complex Leonardo Da Vinci-like drawings and curious symbols, some of which I recognized, and some that I didn't. The all-seeing eye of the Illuminati was there; as was Da Vinci's drawing of the Vitruvian Man; and the numbers of the Divine or Golden Ratio repeating across the parchments: 1.615384. Of course, now I was sure I knew the identity of my correspondent. It had to be Brian Von Bork of Cardas Audio! Back in October 2003, Doc Bottlehead had put on the ever-popular Vacuum State of the Art Conference and Show aka Audio Illuminati Show in Silverdale, Washington. While visiting the many exhibitor rooms, I stopped in to chat with the Cardas folks and was impressed with the innovative hanging magnet cable display designed by Cardas' Brian Von Bork. Imagine a big rack about the size of an upright metal bed frame with a bunch of steel plates hanging from it. On each plate, the decapitated ends of cables were stuck on with magnets, so you could pull them off and investigate up close how each model was made. It was definitely the coolest and most informative cable display I'd ever seen. 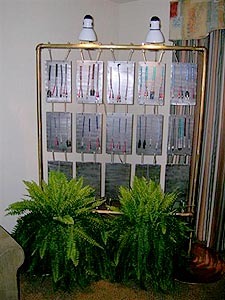 I liked it so much, I awarded it a "Jeff's Picks" for Most Innovative Display Award in my VSAC coverage here at 6moons. In chatting with Brian, we had come to the conclusion that I should do a full system Cardas review for our readers. I told Brian to surprise me and send whatever he thought would be a good match for my system. Boy was I surprised when the cryptic rosewood box revealed a full set of Cardas' top-of-the-line Golden Reference speaker cables and two pairs of Golden Reference interconnects! I was wowed by the ultra-high quality of the fit and finish of this Golden Reference cables set. If ever an audio cable could be called beautiful, it surely is the elegant Golden Reference with its matt-finished navy blue urethane jackets and grey termination jackets around the Rhodium-plated connectors. Very classy! I had specified RCAs on the interconnects, bananas on one end of my speaker cables and spades on the other to match my system needs. 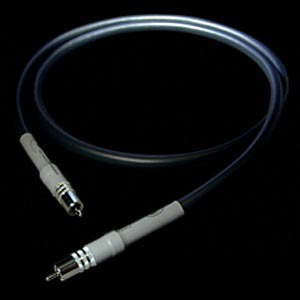 However, the Cardas Golden References cables are available in whatever style connector termination you prefer. The tactile feel of the cables is soft and flexible, making them very easy to position and work with - they are not at all stiff or unwieldy like certain other cables. There is no doubt that the Golden Reference interconnects at $917 per meter and matching Golden Reference speaker cables at $2388 for a 10' pair are expensive and something special just by looking at them and feeling them. They exude a sense of quality much like a fine Rolex watch does. Phi -- 1.615384, the essential ingredient of sacred geometry in Greece, Tantrism, Buddhism, every-day biology and even fractals -- appeared in the very earliest human history and has been referred to as the Divine Number and the Golden Ratio, among other things. Readers of Dan Brown's mystery thriller The Da Vinci Code (which my introduction spoofs) know that the Phi ratio occurs throughout nature in curious places, giving rise to its moniker of the "Divine Number". Did you know that if you divide the number of female honeybees by the number of male honey bees in a hive, you always get the same number? You get Phi. Did you know that each successive spiral of the chambered nautilus shell is related to each earlier spiral by a simple mathematical relationship? Phi again. It goes like that all through nature with various sea life, insects, plants and so forth caught up in the mathematical mystery that is Phi. Not only that, but there is even a connection of Phi to music: The ratio of the 5-note pentatonic scale to the 8-note diatonic scale is a close approximation of Phi, as is the ratio of the 8-note pentatonic scale to the 13-note chromatic scale. Whoa baby! What is it about Phi that makes it so influential? -- along with all kinds of conspiratorial and controversial symbols. I found the pyramid and All Seeing Eye of the Great Seal of the United States, which is shrouded in mystery and intrigue because of the New World Order and Illuminati connections it suggests. I also found a flying saucer and a "the truth is out there" quote from the X-files, a couple of references to Stonehenge, a 666 embedded in the significant figures of Phi, and lots of others. How many can you find? 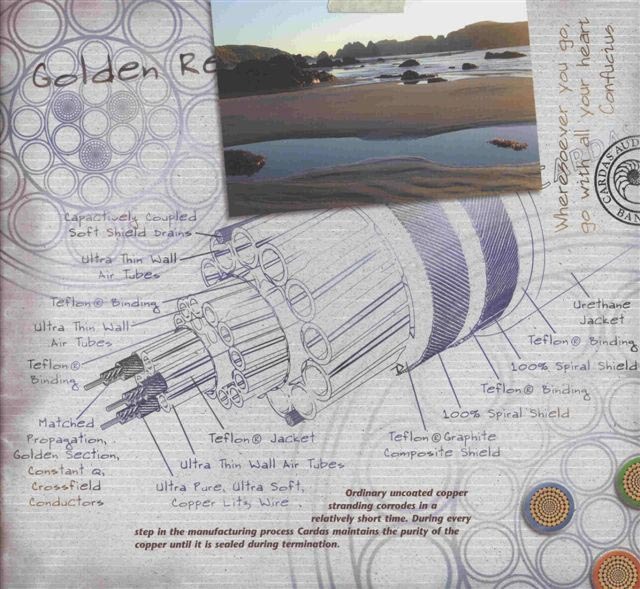 The Golden Reference speaker cable uses Cardas' patented "Golden Section" design, which in this case employs "multi-gauge stranding in a symmetrical, 12 conductor, helical triad of quad-axial planetary arrays of golden ratio, constant Q conductors". Whew! If, like me, you're not sure what that quote really means, look at the accompanying diagrams to see how the cable is put together. The smallest wire strands are at the center of the conductor bundles, and wrapped with copper Litz wire. 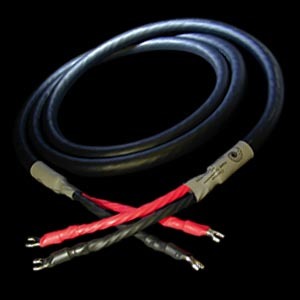 The cable is constructed in a very complex manner with thin walled air tubes that provide a dielectric; internal Teflon jackets that surround the bundles of conductors; a Teflon graphite composite shield; several layers of Teflon binding and spiral shielding; capacitively coupled soft-shield drain conductors; and a final outer urethane jacket. It's obvious from their construction that a huge amount of thought and expense go into making the Golden Reference line of cables.